return true if native camera started. return image type either WVR_CameraImageType_SingleEye or WVR_CameraImageType_DualEye. Suggest to check this before you decide how to display your image. return width of camera image. 0 means camera is not started. return height of camera image. 0 means camera is not started. return native texture id of camera texture. 0 means camera is not started. return true if camera is ready to start. The result of startCamera will update by StartCameraCompletedDelegate. call this API to stop native camera. 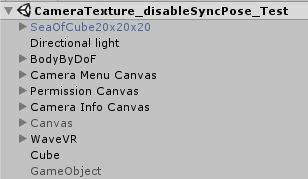 call this API with texture ID, WaveVR will update image content in which id you provided. After update texture is done by native, UpdateCameraCompletedDelegate will be called to notify. Moreover, WaveVR_CameraTexture provides delegates to notify user if camera status updated. Developer is able to monitor delegates to proceed actions after camera status changes. StartCameraCompleted(bool result) is prototype and will be implemented by user who want to monitor camera start result and add it to StartCameraCompletedDelegate, WaveVR will notify user with result after camera start. UpdateCameraCompleted(uint nativeTextureId) is prototype and will be implemented by user who want to monitor camera update complete event. This function will be called if there is no newer data. In this sample, we use Android camera as a camera source. Add permissions to AndroidManifest.xml. Open the sample scene CameraTexture_Test. we add a cube in game hierarchy, and will update camera image on the cube. implement delegates to listen WaveVR_CameraTexture event.